One of the most adventurous things to do on a trip is to go river rafting. River rafting is the most thrilling experience one could ever come across in his/her lifetime. So, if you are planning a vacation in the coming months, then in order to make your trip the most enduring and unique one, you must go to a place which is famous for white water rafting. One should always come out of its comfort zone and try something new and different. Make your personality an adventurous one and try the most amazing river rafting experience and if you are already one of the adventurous ones, then white water rafting will surely make your trip the most memorable one. Get over your water phobias and enjoy the amazing and thrilling experience of river rafting. There are a lot many white water rafting destinations around the world where you can plan your trip and enjoy the best ever rafting experience. But before planning the trip, get yourself trained and mentally prepared as well. If your swimming is a bit weak, then you must make it stronger, then you must search and collect all kind of useful information especially regarding safety precautions to be taken while rafting and of course the risk factor is always there and we all know that life itself is a risk because we never know what will happen the next moment. So, the advice is to live life to the fullest. So, here is the list of the top 15 white water rafting places in the world. Do check them out. 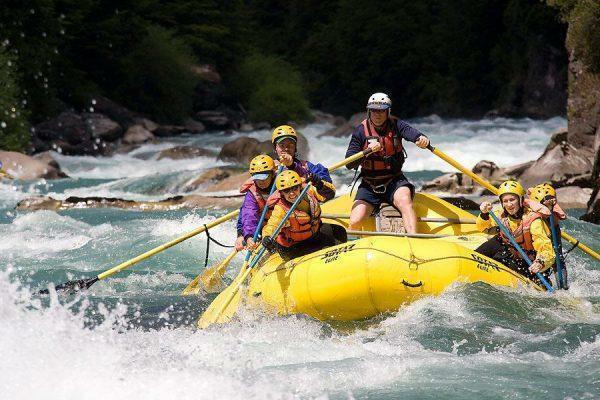 The Futaleufu River in Chile is one of the best places for white water rafting. The rapids are of class V nature and the water is quite big as well. This river is best known for the Terminator rapid which is actually a badass. It is so huge that your rafting boats nearly touch the sky when going rafting here. Rafting here is proved as the riskiest, thrilling and challenging experience by various adventurers who visited this place and tried rafting here. The guides here also have the same viewpoint regarding the rafting experience and it is said that rafting at the Terminator can almost give you a kind of a heart attack. But that is what a true adventure is. The rafting experience out here will let you explore huge waves, the amazing cliffs, and the thrilling thunder. So, to make your bellies groan, try this white water rafting experience for sure. This is a class IV nature of rapid situated at British Columbia in North America. The waves at the Bidwell at the Chilko River are huge with deep holes which are quite risky as well but at the same time exciting and thrilling also. The rafting area is around 14 miles long which is quite a long distance to cover and is counted among the longest rafting stretch till now. The advice by the guides here is this that if your beginning is not correct, then Bidwell can turn out to be the worst experience ever but if the starting is good then it can actually turn out to be the best experiences of your lifetime and then you don’t even need to any kind of swimming as well. Situated on the Colorado River, these two drops go through the Cataract Canyon and are considered one of the most amazing rapids of class III. Even though the big drops 2 and 3 are not one of the high-class rapids but when you actually experience these drops one after the other in real, your heart will surely come out in your mouth. The rafting area is around 18 miles long and the guides have rated this place as the most thrilling, scary, challenging and of course adventurous one as well. These two drops are one of the biggest rapids on the whole of North America where river rafting happens. Lava Falls is located at the Grand Canyon of the Colorado River in Arizona and is one of the greatest rapids of its time. The class of the rapid is X which is extremely high and the falls are around 37 feet deep which is considerable the deepest. The guides also consider this place to be the most challenging and scarier one of course due to the huge black rocks and the big Lava holes. But if you pass the struggle, then you can relish the luxurious amenities at the Tequila Beach situated at the end point of the Lava Falls. This white water rafting destination is the most thrilling one. The view is amazing surrounded by beautiful and sacred waterfalls on both sides of the river with a perfect backdrop of the Andes Mountains and of course the green canyons which are really breathtaking. The waves of the Godzilla can go up to 15 feet high which are a great height and the water of the river flows really fast as well making your rafting more challenging. The water flow is so fast and high that if you start your rafting from right to left, you will unknowingly end up to going from left to right. West Virginia is considered as the hub of white water rafting. It has around five major rapid rafting destinations but Pillow Rapid is considered to be the best of all which is situated on the Gauley River. It is class V rapid and the flow of the river is so fast that it can but your rafting boat deep down up to 30 feet. So, in order to avoid such a scary experience, it is advised to go to the Pillow Rock so as not to face the bad situation. But all in all, the rafting experience here is quite amazing and adventurous. The Ghostrider at the Zambezi River in Zambia is another quite adventurous white water rafting destination that you can try out. As the name suggest, your experience here will be an exciting one for sure and an unforgettable as well. Apart from this, this place has some amazing rapids to its list like the Gnashing Jaws of Death and the Stairway to Heaven. But the most thrilling of them is the Ghostrider where the size of the waves is so huge and gigantic that your boat merely gets to see the outside world. The rapid is of class V and is quite an enduring place to visit for sure. The best time to visit this amazing place in Nepal is after Monsoon i.e in Mid-October when the waves of the Karnali River are in total high spirits. The beautiful scenery around the river is a must thing to watch out for which includes the beautiful lush green and dense jungle area and the huge and gigantic peaks of the Himalayas. This is why this place is named as the God’s House as you actually get to experience heaven out here. The rapid here is of class V nature with huge waves which run at quite a fast speed. But beware of the large holes which can turn your rafting boat upside down making your rafting trip a challenging one. Chattooga River in Georgia has some of the most amazing and thrilling rapids like Jaw Bone and the Seven Foot Fall but the Bull Sluice tops the list. It is a class IV rapid and will surely give you one of the best rafting experiences of your lifetime. The Bull Sluice has a 14 feet deep drop which can actually give you a heart stroke. Apart from that, the rafting journey here is also quite a challenging one as you get to face a lot of rocks called the Decapitation Rock and of course the big holes which you need to beware of. The plus point of this site is that there are different routes to reach the rapid of Bull Sluice and the backdrop is extremely beautiful. Clavey Falls at the Tuolumne River in California is actually a dream rafting kind of an experience. The drops are so frequent that you barely get time to get back to your normal position which means the rafting journey is full of scary moments and is 100 percent a risk one for sure. Though the rapid is of class I category which means the water speed is slow and calm but you never know when it turns into a storm. The drops are around 8 feet deep and the amazing sound of the water is an unforgettable one. Do visit the place for the most thrilling rafting journey. Magpie River in Canada is situated at a very remote and peaceful place surrounded by beautiful mountains covered by pine trees. The rapid is of class V nature and the drops start as soon as you start your rafting journey from River Magpie and as you move further the depth of the drops and the speed of the rapids go on increasing making your rafting journey more thrilling and challenging. The scariest rapid comes near the Magpie falls where the waves are gigantic due to the extreme flow of water. After your rafting journey, you can camp around the river islands and ensure the beauty. This river provides you an amazing experience when it comes to river rafting. The river Johnstone is situated in Queensland and is surrounded by beautiful tropical forests and amazing volcanic mountains. The rapids here range from class IV to class V depending upon the flow of water. The plus point of this place is that a helicopter always supervises your rafting journey and is always there at your starting and end points. The night view of the location is extremely breathtaking and you can create a bonfire and camp around the forest area to make your trip a more adventurous one. Situated at the border of Tibet, Sun Kosi River in Nepal will give you the most unforgettable experience in rafting. The cherry on the cake are the high peaks of The Great Himalayas and the plain of Ganges. The rapid here is of class V nature and the rafting journey is extremely narrow which quite a challenge is for any rafter. The river Sun Kosi is surrounded by beautiful canyon forests which are extremely dense and have an amazing wildlife as well. The drops are quite exciting out here which can actually pound your heart out. Church River in Turkey tops the list of the most in demand rafting destinations around the world. This is due to its extremely fast flowing water and the beautiful backdrop of the Mountains at the Northeastern side of Turkey. The rapids are quite high due to the speed of water and you can’t even imagine the depth of the drops that you will experience here in your rafting journey. The river surrounded by amazing mountains and jungle as a wide variety of wildlife as well like goats and bears. Apart from that, the place has some quite antique and old ruins of castles as well. The Noce River in Italy is surrounded by the Alpine Glaciers and the area is quite remote and calm as well. The rapids here are of class V nature and the water actually makes you scared with its roaring sound. The rafting journey is a full on thrilling experience with breathtaking drops and the eye-catching surrounding of the beautiful jungle. It is one of the most amazing river rafting destinations in the whole of Europe. So, these are the top 15 white water rafting destinations in the world which you must explore once for sure.